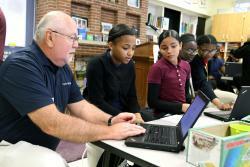 Harrisburg, Pa. – Capital BlueCross today donated 80 refurbished laptops to the Marshall Math Science Academy in the Harrisburg School District. The computers will be used by students in fifth through eighth grades. The donation will allow the students to participate in higher level projects not supported by their old computers. The laptops were previously used by Capital BlueCross employees, and were no longer needed by the company. Each laptop was wiped of all data and programming before being given to the school. The laptops will be housed on mobile PC carts that can be wheeled to different classrooms and locations within the school. Students will use them to work on a variety of projects including website design, commercial and documentary creation, data and graph analysis, and the design of tiny houses and simple machines. “Capital BlueCross has not just given our students and our school much needed PC laptops, it has created opportunities for the future success of our children,” said Ryan Jones, Principal, Marshall Math Science Academy. "True to its mission, Capital BlueCross is more than a health insurance company. As an educational and community partner of Marshall Math Science Academy, their generous donation of 80 laptops helps to strengthen the District's commitment to 21st Century Science, Technology, Engineering and Math (STEM) education by replacing aging computers and placing newer technology at the fingertips of our students," said Harrisburg School District Superintendent, Dr. Sybil Knight-Burney. "We are extremely grateful for the support of Capital BlueCross and we are excited to see how this technology donation will inspire our students to achieve new heights in learning, innovation and STEM project development." Capital BlueCross donates time, resources, and financial support to organizations that improve local communities throughout its 21-county service area in Pennsylvania. Specific areas of focus are health and human services, education, arts and culture, and good corporate citizenship.